Is Your City Hosting a Super 1 Day Photography Workshop? Find Out! There’s nothing quite like in-person learning when you’re diving into the deep subject of photography. It really helps to get a feeling for what you’re doing and to have the ability to ask questions live. 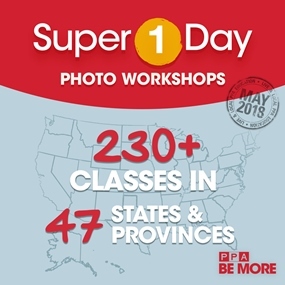 Super 1 Day is PPA’s biannual, in-person workshop program, jam-packed with informative sessions hosted by some of the top professional photographers working all over the country. All photographic classes will be held October 8-22, 2018 so you'll be able to find one that fits your educational needs and your schedule! The classes are all posted now so you can find the one closest to you. Live in South Dakota? We've got two classes for you! Rhode Island, there’s one for you too. There’s even a class available in South Korea. And now that we have all the stats, we can announce the state with the most Super 1 Day workshops is Texas with a whopping 27 classes available! Hey, it’s a pretty big state, so that’s to be expected. North Carolina comes in a mighty second place with 17 and Maryland with a surprisingly healthy 15 classes available. There are a variety of classes, so no two are going to be the same in your area. For instance, if you live in Wyoming, we’ve got you covered with classes on Landscape Photography, Print Competition, Certification, and the Business of Photography. Check out all the classes and workshops available now and hurry, online registration closes September 28, 2018!